Look at all those gliders! For those familiar with Strubby as a tiny, sleepy club, where a day may run with only a single K13 flying, yesterday was a shock to the system. While the log book may only show 19 launches, on closer inspection five gliders were flying and a Turbo-Falke came in to aerotow a visiting glider back to base. At one time there were two wooden ships, three glass and a motor-glider all sitting on the field. The day started with the K13 out for the students, K6 out for solo pilots and Astir being flown for practice in glass; later, as the newly-arrived DG300 was being rigged and adjusting to hearing so much English being spoken, a strange Astir appeared in circuit. The Astir pilot had just completed the 50km stage of his Silver C by arriving at Strubby from Cranwell. It was his third attempt at this cross-country voyage, and it was on his fourth launch of the day that he finally got away so congratulations for his persistence. 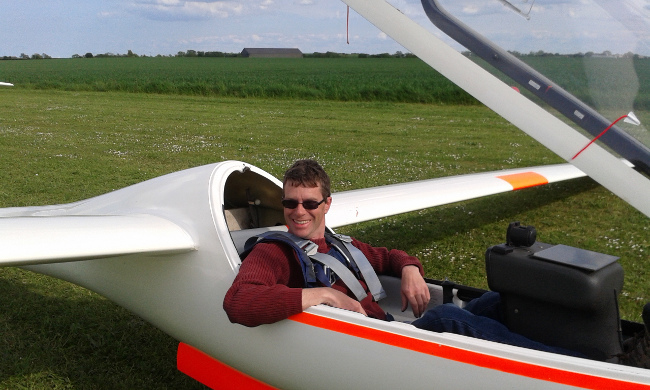 Meanwhile, the DG was still being rigged “for practise”, but its shiny newness proved too tempting, and Derek (instructor) took it for the maiden launch from Strubby, shortly followed by Paul, who came down beaming – one happy new owner! 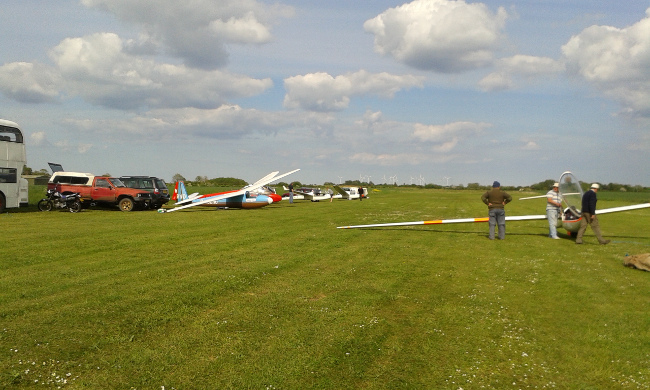 All this activity led to occasions where there were three gliders soaring at once – a busy day day, and an unexpectedly crowded sky, even before taking into account the very large models being flown from the modellers’ strip. One model glider was so realistic that on the ground it was difficult to anticipate which of the shapes in the sky was due to land back on the gliders’ strip. It was good practice for trips to busier sites, with lots for the pilots to be concentrating on, and tests of judgement and control when planning circuits.